The International Livestock Research Institute (ILRI) in Ibadan, Nigeria, recently developed a technology to process fresh cassava peels into high quality cassava peel products with better shelf life and nutrient profiles acceptable to the feed industry. 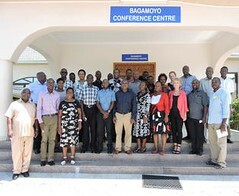 The activity is an outcome of a multi-centre CGIAR collaboration including ILRI, the International Institute of Tropical Agriculture (IITA) and the International Potato Center (CIP) and several CGIAR research programs: Roots, Tubers and Banana, Humidtropics and Livestock and Fish. The three critical stages of successful technology generation – technology development and refinement, technology pilot testing and validation and finally technology commercialization for the cassava peel processing technology began in late 2014. Through this technology around 50 million tons of peels that are currently being wasted each year and treated as environmental nuisance will become a tradable livestock feed commodity. It has the potential to add around 15 million tons of quality feed creating a USD 2 billion a year industry in Africa, immensely helping the livestock sector besides other multiple benefits like creating employment and incomes for the cassava processors mostly women in the unorganized sector along the value chain and cleaning of the environment. The main factors contributing to the rapid development of this technology are that the processes involved are quite simple, using machinery and techniques that cassava processors are already aware of, and wide dissemination through multiple media and visits of the potential entrepreneurs to the ILRI pilot processing plant at Ibadan. Apart from these, creating markets for the processed peels was the most critical factor to create the market pull. This was achieved by partnering with industry partners, including Amo farms, one of the largest poultry integrators in Nigeria, which participated in multiple feeding trials. The trials created the necessary confidence in the industry on the nutritive quality of the products and created a huge demand for the product. 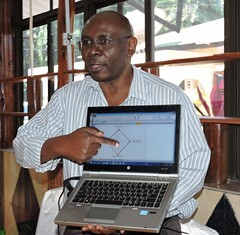 With the favourable developments in place like abundant low-cost and year-round availability of cassava peels, appropriate and simple technology to process the peels, strong demand from the feed industry due to the high prices of traditional feed ingredients, entrepreneurs seized this opportunity to commercialize the technology. The first major success of commercialization came through selection of Niji Foods, a cassava processing firm, to set up three cassava peel processing units with financial assistance from USAID. Selection of the technology and the willingness of Niji foods to fund 50% of the investments testifies to the financial viability of the technology and its relevance to the regional needs. Under this agreement, Niji Foods and ILRI will train up to 750 women and staff involved in cassava peel mash processing and business management providing long term employment and hand over partial ownership to at least 3 women’s groups. Additionally, Durante fish feeds, the largest fish feed manufacturer in Nigeria send some staff to be trained on cassava peels processing at the ILRI Ibadan pilot demonstration unit. They are now setting up a pilot processing unit investing their resources to use the processed cassava peels as feed ingredients in livestock and fish on commercial lines. Further away, the technology is being commercialized in Benue and Kogi states through processing plants set up through the efforts of Synergos Development Innovations, Nigeria with technical assistance from ILRI. Although the six upcoming units (3 by Niji foods, one by Durante, and one each in Benue and Kogi state) are a small step in exploiting the vast potential, success of these units will create necessary confidence among other entrepreneurs and the feed industry to establish more units benefitting the cassava processors, feed industry and the environment. The Nigerian environment ministry also announced plans to establish six more processing plants, while ILRI has received enquiries from entrepreneurs in Nigeria, Ghana, India, Malawi and South Africa. Watch a film about this new technology: Adding value through existing technologies, 2015. Tags: cassava, RTB. Bookmark the permalink. Dear Sir am really interested in learning from your experience am the owner of Livestock Bank Ltd company deals with livestock farming in Rwanda, it will be my pleasure to learn from your experience in your state. Thanks for your interest. I would reach you on the phone for further discussion. Please send a mail to t.amole@cgiar.org for more information. I am intrested on how to process cassava peels for animal and also geting the machine. Thanks for your interest. Kindly send me your contact for further discussion. please, I am from Ghana and I am interested in this innovative way of turning cassava peels into animal feeds. Honestly is a good processing. Where is this company been located. I need address and phone no. to get in touch with you. This is great, please how can I get the process of making and mixing the feed . Am from southern Kaduna Nigeria, please how do we start up this business over here. We are rich in cassava. How can boiled cassava be useful in livestock feeding?